Cold Wax Painting is a delight for artists who are interested in texture and layering. It means you are painting with an impasto oil paint that is often scraped on, layered and drawn back into. Unlike Encaustic Wax painting you do not need to heat the wax, it comes as a creamy medium that you mix with oil paint or powdered pigment. At Jackson’s we stock five makes of cold wax paste mediums – each made to a different formula. All have beeswax as the main ingredient but each then has either a resin (damar or alkyd), or a solvent (turpentine, citrus or odorless mineral spirits) or both, in different amounts. This means they all perform differently and artists will prefer the one that works best for their particular technique. 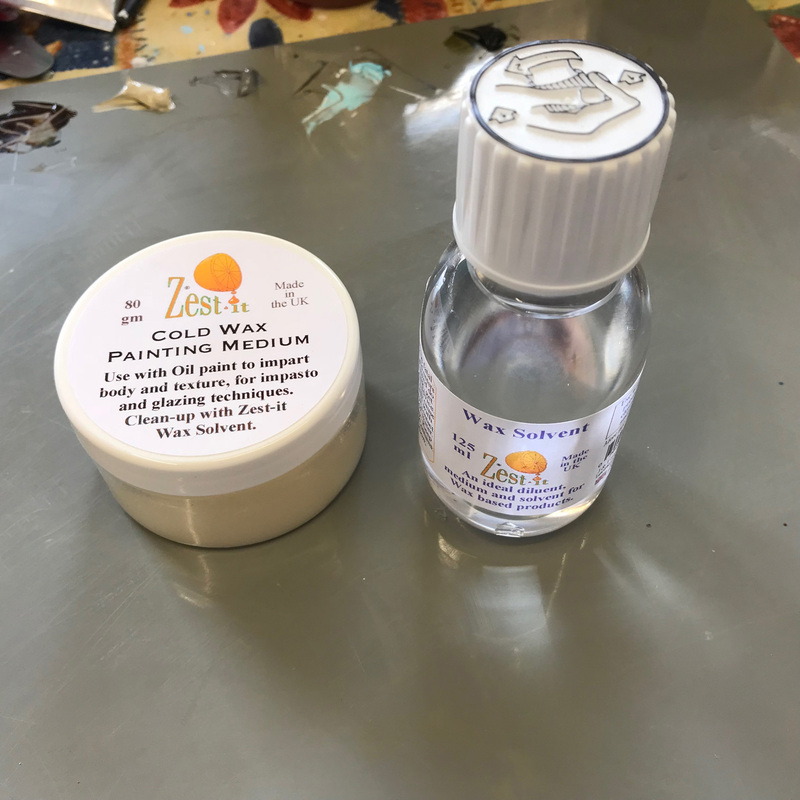 As an experienced user of Cold Wax Oil Painting Mediums in her painting practice, we asked Zoë Taylor to give us some feedback on the new Zest-it Cold Wax and Solvent. 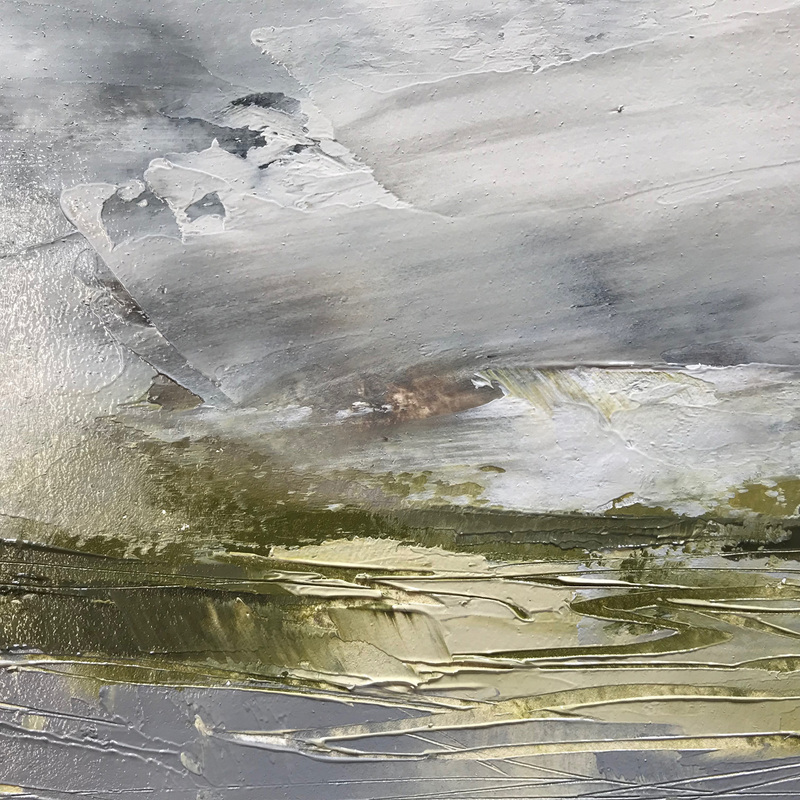 We wanted to know what characteristics a painter could expect from it and what about it is different to the other makes of cold wax that painters might already be familiar with. Zoë Taylor is a self taught artist who works from a small studio in Worcestershire. Whilst she has always painted, she has only started exhibiting in relatively recent years. She now exhibits widely across the UK and had a very successful solo exhibition last year. I use cold wax medium in all my oil paintings. I started by using Gamblin Cold Wax and moved on to Dorland’s Wax. I also paint almost exclusively with tools rather than brushes and this may have a bearing on the results I found with the comparison. When Jackson’s put on their social media that there was a new cold wax supplier on the block, Zest-it Cold Wax, I thought I would give it a go and see what it was like. Jackson’s sent me a small pot of Zest-it Cold Wax together with a small bottle of their Wax solvent. Sample pot of Zest-it Cold Wax Painting Medium and Zest-it Wax Solvent. So this is my impression of the product and comparison with those that I am more familiar with. Gamblin Cold Wax Medium and Dorland’s Cold Wax Medium are very similar to each other so I was expecting the Zest-it wax to be along similar lines but I was surprised to see that it wasn’t. The Zest-it Cold Wax Painting Medium is a much more yellow-coloured product in comparison to the other two. The colour didn’t bother me as you cannot see the colour of the medium when mixed with oil paint. It is much more translucent than the others and has a completely different texture. It’s hard to describe the Cold Wax consistency of Gamblin and Dorlands Wax if you have not come across it before but it is a kind of matt paste which is smooth to spread. The Zest-it Wax has the consistency of petroleum jelly. It is very shiny and appears greasy and somewhat stringy. When you take it out of the pot with a painting knife it is like taking a thick sticky honey out of a jar. When the Wax is mixed with oil paint you get a very shiny, quite soft result. This is not like the other waxes. I’m used to the wax making the paint thick and quite stiff to use and also to be more matt. So for me and my painting style this was not what I would like to use. Having said that, I did make a small painting on Arches Oil Paper, just to see how it performed. The painting finish when it dried was quite nice but more shiny than I would expect from the other waxes. It was just too slick, too shiny and not for me. However, I think that differing painting styles might find a place for this product as the shiny appearance may well suit other painters. Each has differing amounts of creaminess, shine, odour and drying times. Each recommends different maximum amounts of wax medium added to your oil paint. Read more on each product page. Zest-it Cold Wax Painting Medium – available in four sizes. Gamblin Cold Wax Medium – available in two sizes. Dorland’s Wax Medium – available in three sizes. Michael Harding Beeswax Paste – available in three sizes. Wallace Seymour Beeswax Impasto Medium – available in two sizes. Postage on orders shipped standard to mainland UK addresses from jacksonsart.com is free for orders of £39. similar way to scumbling but without using opaque colour.